West African patients infected with the Ebola virus will not have access to experimental drugs being used to treat American cases of the disease for several months, if at all, Nigerian health authorities said on Thursday. Health minister Onyebuchi Chukwu told a press conference he had asked the US health authorities about the unproven medicines used on two American doctors, but was told such small quantities existed that west Africa would have to wait for months for supplies, even if they were proved safe and effective. Dr Kent Brantly and Dr Nancy Writebol of the evangelical Christian organisation Samantha’s Purse contracted the virus while helping to treat victims in Liberia. They were given the drug ZMapp after being evacuated to the US, and appear to be recovering. A spokesman for the US Centres for Disease Control said “there are virtually no doses available” and they would take several months to manufacture. Even if supplies do become available, medical ethicists are divided over whether they should be used in the current Ebola outbreak in west Africa. The World Health Organisation (WHO) has called a meeting of experts next week to help it guide doctors and drug companies who may consider shipping experimental drugs to the four countries hit by the disease. Prof Jeremy Farrar, director of the Wellcome Trust, welcomed the meeting, saying there were critical ethical questions to consider. He called for the rapid establishment of “rigorous protocols for the study of experimental interventions”, so that African countries could have the same opportunities to consider them as western ones and to ensure there would be equitable access to any treatment that worked. Jonathan Ball, professor of molecular virology at Nottingham University, said there were many questions. “Giving unlicensed and untested (at least in humans) treatments and vaccines is a very thorny ethical issue,” he said. “The infected US healthcare workers are receiving a type of treatment (antibodies that specifically target the virus) that has a reasonably long safety track record, so it isn’t surprising – given the high fatality rate in the current outbreak – that they are happy to receive the therapy. Some of the new treatments have not been tried with human at all, said Prof Tom Solomon, director of the NIHR health protection research unit in emerging and zoonotic infections. It is usual for drugs to be tried in healthy volunteers first, in case of side-effects. “The difference here is the desire for this ‘first in man’ experiment to be for a patient with the disease,” he said. Paul Hunter, professor of health protection at the University of East Anglia, said most doctors in a situation like that of west Africa would want to try a drug that might work. “In my view, the ethical case is unequivocal. If a patient is likely to die and an experimental therapy has a reasonable chance to prevent death, then it should be given. However, this does not mean that any old drug could be given. For an experimental compound to be given, there should be good prior evidence that the therapy will work, the patient or his relatives should give informed consent wherever possible and whenever the therapy is given proper records must be kept and the outcome reported to WHO,” he said. Unicef, meanwhile, warned that children who had been orphaned by Ebola were finding themselves shunned by their communities. “Children who are orphaned by the disease are finding it hard to be accepted in their communities and this has had huge psychological impacts on their lives,” said the Unicef representative in Sierra Leone, Roeland Monasch. 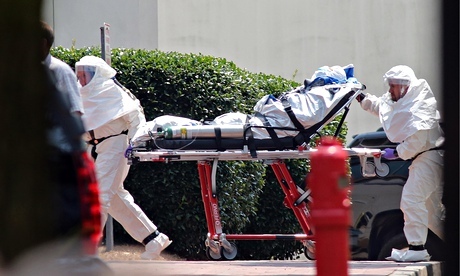 Should the CDC Release the Experimental Ebola Drug ZMapp in Africa? Posted on 9th August 2014 by newsafrica. This entry was posted in Africa, Ebola, EU, Guinea, Health, Liberia, Sierra Leone, USA and tagged Centers for Disease Control and Prevention, Ebola, Ebola virus disease, Emory University Hospital, Liberia, Sierra Leone, United States, World Health Organization. Bookmark the permalink.